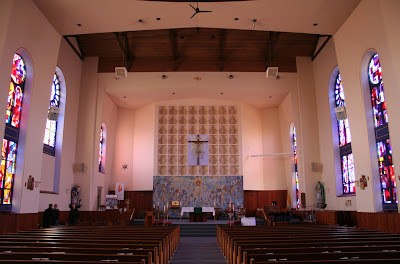 St. Ann church in Peoria, Illinois was originally known as St. Boniface, however parishes within the city of Peoria have undergone a number of restructurings and closures over the years. The name change occurred in 1994. Built in a a Neo-Romanesque/Byzantine style, the current church was constructed in 1895. A disastrous fire occurred in December of 1966, completely destroying the church's interior. Most of the rebuilding was undertaken by parishioners and the church was eventually rededicated in April of 1969. The result is the interior as it appears today; clean cut but no shortage of art. Certainly a triumph over tragedy. 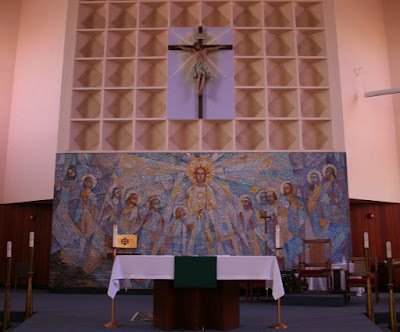 The dominant element of the sanctuary is a fine, imported mosaic of Christ and the Apostles at the last supper. 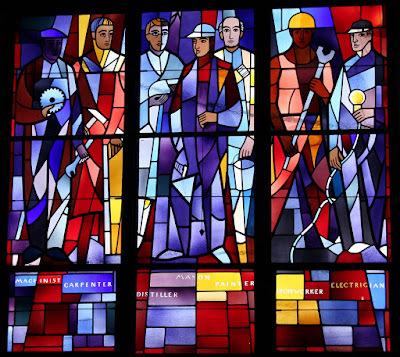 The colorful, contemporary windows were created by parishioners. St. Ann has historically been known as "the worker's parish." An art-glass window in the transept depicts the parish's dominant professions at the time; a beautiful connection between everyday live and the Divine. There's actually a bowling alley in the basement of the church! When the original alley was installed in the early 20th century, there was a law in place stating that alcohol could not be sold to the public before noon on Sundays. The answer? The parish men's group decided they build a bowling alley as part of their "private" club, thus gaining the ability to serve beer no matter the day or hour. The bowling alley flourished, and when the church burned in the 60s, it was decided that the alley should be rebuilt. It's still going strong and hosts league bowling most nights.